I’ve been teaming up with Nishanga Bliss on a series of FREE workshops at The Cog. It’s been fantastic, so I just wanted to share. Nishanga is a wealth of knowledge about sustainability, nutrition, and tasty food. 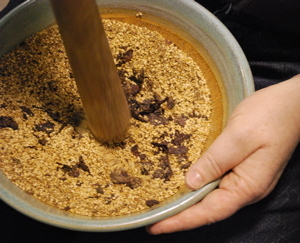 A chef and acupuncturist, she holds a Masters in Chinese Medicine. We make a great tag-team because we’re both passionate about food and strive to eat and teach others to eat as sustainably and healthily as possible. And Nishanga knows about all the stuff I don’t know about, like sea vegetables, so I love her for that. Plus she’s cool. Her workshop really opened my eyes. I’ve always enjoyed sea vegetables when I’ve encountered then but I knew next to nothing about them. She talked about how sea vegetables can absorb and flush environmental toxins from our bodies and that they are a super sustainable way to get some of the important nutrients we get from the fish in our dwindling oceans (PS: I’m reading Bottomfeeder great read and—yikes!) But we have to be careful where our sea vegetables are coming from…because they do absorb toxins and heavy metals and we don’t want to eat that stuff. There’s a local brand called Mendocino Seaweed Company that harvests from the clean waters off the Mendocino Coast. 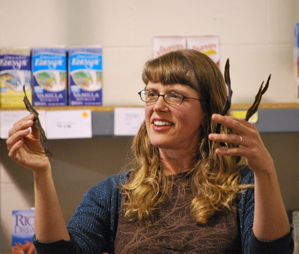 She demonstrated and talked about the different types of seaweeds from strand seaweeds like arame, hijiki, and sea palm, to the strip seaweeds like kombu and wakame to the sheet seaweeds like dulse and wild nori. 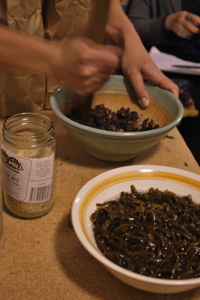 I went from knowing that kombu was good for cooking beans and that I really liked nori to knowing much more—like the different applications for each seaweed and that dulse is seriously tasty. I even walked away with some good recipes. We’ll be doing another round of workshops starting in May. We’re thinking of fermented drinks, another kraut/kimchi workshop, homemade body products, main dish salads, and some other ideas. These are free workshops so they are a great way to gain knowledge without shelling out $50-75 for a cooking class. You don’t have to be a member of The Cog, but we’d love it if you join. Then you can run your own workshop on whatever you do well. This is just the beginning of what a community based food system looks like. Check it out! And check out Nishanga’s blog. You’ll learn a ton. This entry was posted in classes, community, food sustainability. Bookmark the permalink. Post a comment or leave a trackback: Trackback URL.